Disclosure: I received the gift cards for my meal and the gift cards I'm giving away from the Wendy's + Shamrock Farms Teams. All opinions are my own. Today after a very fun trip to the park our little family of three took a trip to Wendy's for lunch. I absolutely consider strategic trips to the drive thru a Working Motherhood hack. Whether its because of a time crunch between activities or no drive to cook after a long day of work and extracurricular activities being able to grab food on-the-go is an awesome convenience. 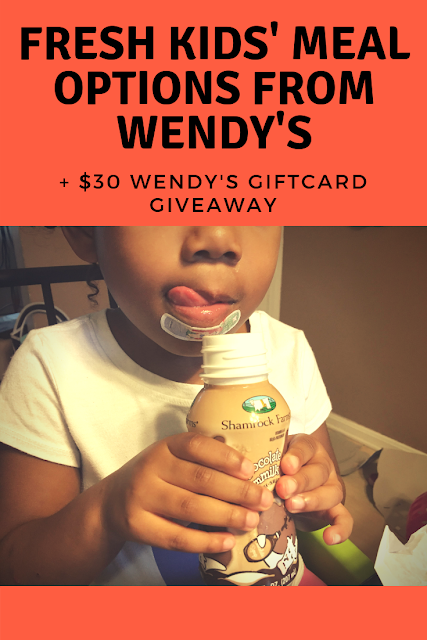 It's great that Wendy's and Shamrock Farms have teamed up to offer fresh options in Kids' Meals - milk (regular and chocolate! ), grilled chicken wraps, and a seasonal Strawberry and Blueberry cup. I have $30 in gift cards that I'd like to give away to one of my lovely readers! Enter in the Rafflecopter widget below. The giveaway closes midnight October 15th.